New Year’s is a night where you can reflect on the highs and lows of the past year….. or you can make a record number of toasts to a new one, do something crazy and not even notice when the clock strikes midnight. 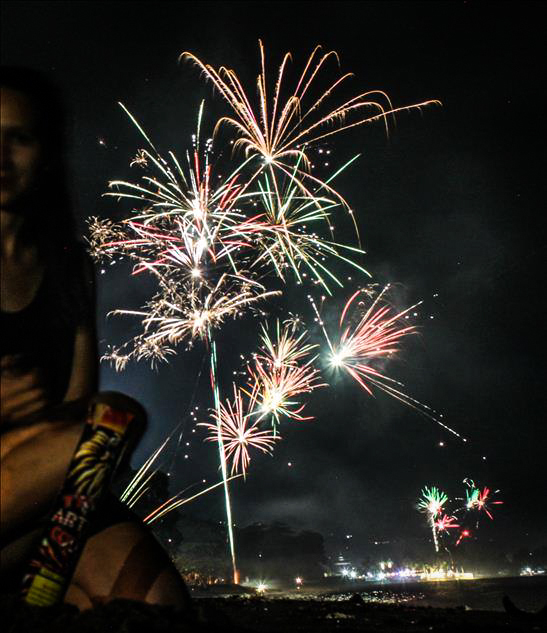 I bought fireworks , so I think you can deduce what kind of New Year’s I had in Lovina, Bali this year. Let me begin by dispelling any myths: fireworks are dangerous. Anyone who tells you otherwise is just trying to get you to do something dangerous. You can study the diagrams, you may even be able to read the Chinese characters on the warning label: but nothing will prepare you for what will come once you ignite the fuse of an explosive device. After devouring an entire mahi-mahi for dinner, we headed to the beach to join the firework extravaganza. There were your standard ground fireworks and kids with sparklers. But then there were also cannons propelling real 4th of July worthy fireworks from the sand to explode over the water, reflecting a spectrum of light on the crashing waves and black sand. Everyone was taking part, old and young alike were dancing on the sand like crabs scuttling back and forth. As I launched a dozen sparkling missiles from the beach (scorching my fingers with failed attempts and scrambling in the sand to run away from explosions) I wasn’t really thinking much. But, in retrospect, it seems a fitting ending to the most eventful year of my life. You take a huge chance when buying fireworks, after all, it could blow up in your face and send you home crying, but that’s the same with any big leap of faith right? (just maybe not so literally). So then you light one up, and you get all excited when the first burst of light explodes over the water. You’ve been a catalyst to this beautiful chemical reaction that lights up a formerly dark blank canvas sky. Obviously crossed fingers count because you got lucky, all limbs are intact. Over more and more attempts you attain some minor injuries. (I ran into a thorn bush while fleeing the site, scorched my fingers trying to get a good light and some flying debris burned my shin a little) But in the end, when all your fireworks have been lit, you have stories to tell, scars to show and you’ve lit up the sky and literally shot for the stars. Somewhere in there are some metaphors for life and traveling. So, just how much can be accomplished in a year? I dropped the entire way of life I was used to, took my blank passport, put my student loans on hold, and decided to do something while I’m still young and able (not to mention in my prime for taking photos to show 20 years from now). No ride is complete without speed bumps and potholes, especially here on the streets of Indonesia, but when I look back on this year, at all I’ve seen and done; I can’t help but see that 2013 had set fire to the canvas of my life. And, like my mom suggested, I made a list of the things I’ve done this year. Most are also blog posts in the archive, but here it is. Thanks for the advice, Mom. I love you. 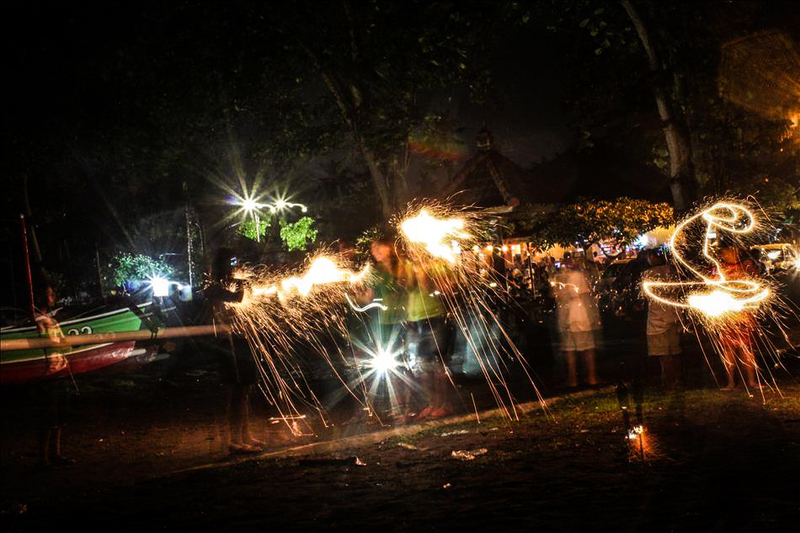 January:Rang in the New Year on Gili T.
Hugged a stranger, Soaked more strangers. Had rainbow cake and ate it too!